4/20/2019 6:12:25 AM - We are happy to announce that Jim's latest recording "Magic Meeting - Live at the Village Vanguard" has been awarded the Choc de L'ane'e Award from Jazzman/France. The award is the highest award given by Jazzman and it is reserved for the best recordings of the year. Magic Meeting features Scott Colley on Bass, Louis Nash on Drums and was produced by Brian Camelio and Scott Colley. Congratulations Jim! Mr. Hall has a technique equivalent to that of any classical guitar soloist and an electronics kit that could out-tech any rock 'n' roller, but his music is strictly jazz. "His intensely intimate music gets under your skin rather than grabbing you by the lapels....Mr. Hall has a sound as recognizable as the voice of a friend. His floating, fine-grained tone is smooth and edgeless, his wide-spaced harmonies subtly oblique." 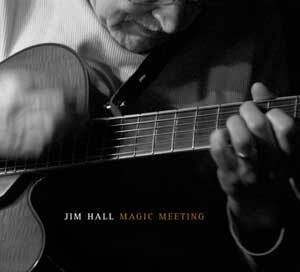 "Jim Hall is the reigning master of the jazz guitar. This poetic player says more with fewer notes than any living improviser." "A master of understatement, Hall is one of jazz's most respected improvisers, an artist who wields his guitar like a paintbrush, shaping and shading each note to achieve just the right hue and texture. Modest and soft-spoken, he has inspired two generations of jazz musicians with his vast harmonic knowledge and restless musical curiosity." "His work speaks as much to the human condiction as any artist past or present, and if one looks and listens attentively, there are great rewards to be found there." "Mr. Hall's dry-toned guitar playing with its discrete, deliberate notes and sliding chords works like a bluesy telegraph signal." "Since 1955, Hall, jazz' most lyrical and harmonically fertile guitarist, has jousted with top jazz stars like Ella Fitzgerald and Sonny Rollins. And his approach has shaped a younger generation of guitar heroes, from Metheny to Bill Frisell."